The Hyakumangoku Matsuri is the main annual festival taking place in Kanazawa, Japan. The main event of the Hyakumangoku Matsuri is the Hyakumangoku Parade, a great-flamboyant procession of people in historical costumes performed on the first Saturday of June. The people leave the east gate of Kanazawa Station, parade the main street for 3.1 kilometers, and enter Kanazawa Castle. 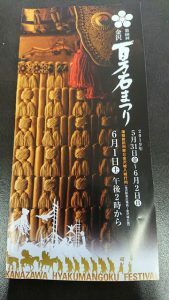 A prominent actor plays the role of Toshiie every year, followed by more than 2,000 residents including those in princesses and warriors’ costumes and teams of traditional performing arts of Kanazawa, such as the Kaga Tobi group reenacting traditional firefighters working under the Kaga lords in Edo. A magnificent departing ceremony is held in front of the huge glass dome and the wooden gate of the east exit of Kanazawa Station, and an entry ceremony is held for the entry of the parade into Kanazawa Castle.